For Enda Kenny, the shoulder-punching, twinkle-eyed, 'embarrassing uncle' persona that infuriates many at home was the perfect cover for an unexpected but welcome show of principle. 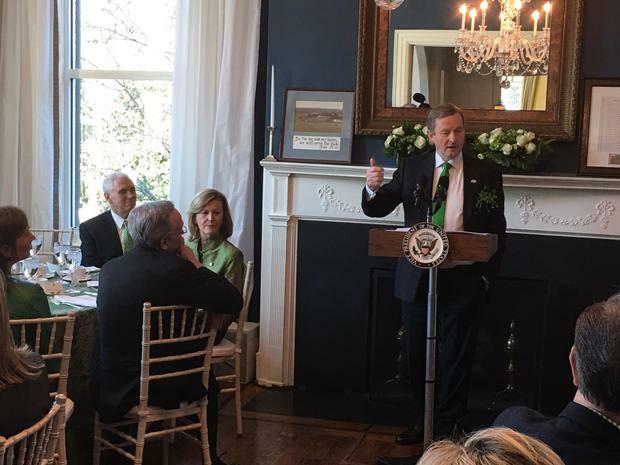 At the annual St Patrick's Day Speakers Lunch on Capitol Hill yesterday, things had got off to rough start. And this was before much of the flat Guinness had been swallowed. The Taoiseach, pouring on the Oirishness, opened with his speech with the cúpla focal before stopping, turning to face the US president and clarifying: "I didn't say anything disparaging about you at all there." A brief pause, but then he was greeted by that famous rictus grin, and a big laugh from the other guests. Sufficiently emboldened, he went again. "They say the Irish have the capacity to change everything," he mused. "I just saw the president of the United States read from his script [another pause, this time Enda's] entirely." Given Donald Trump's infamous propensity to veer wildly off into tangents during speeches, answers or Twitter rants, this was quite the dig. And given he had met the leader of the free world for the first time less than two hours earlier - and even then only for approximately 30 minutes - it was an unusual, even foolhardy approach. The Taoiseach's supporters would claim it showcased the best of Mr Kenny - that bonhomie, joviality and ability to put foreign leaders and diplomats at ease in a short period of time, or what Pat Rabbitte has described as his fantastic "front-of-house hotel manager mode". At home, many will have been asking for the sick bucket. A penny for Kellyanne Conway's thoughts at the next table - probably dismissive. This was hardly the tough-talking Taoiseach we in Ireland had been led to believe was not going to kowtow to Mr Trump when he got the opportunity to put forward Ireland's concerns on issues as diverse as immigration reform and the future of the EU. There had been no sign of that tough-talking Taoiseach, either, outside the White House just after the bilateral meeting had taken place. Then, looking all of his 66 years, he faced an expectant media and pushed out a string of dull platitudes: the pair had discussed the elections in Northern Ireland and Brexit, talks in relation to the undocumented Irish were "positive", he had emphasised to Mr Trump the potential for future transatlantic trading opportunities. Two minutes out of the much-anticipated Oval Office meeting and if it had gone well, he was doing a fine job of concealing it. But did we really expect any different? Was Mr Kenny really going to give this administration a dressing down? Was that ever really an option for an Irish leader? Earlier still, he attended breakfast at the beautiful home of Vice-President Mike Pence. Mr Kenny didn't eat the layered omelette and Applewood smoked ham, but that was because he was too busy talking rather than any stated inability to stomach the hypocrisy. Indeed, the only 'news' to emerge from the White House during Mr Kenny's visit was during the manic photo opportunity in the Oval Office before the meeting even took place. A large horde of journalists, videographers and photographers queued for a short time in the West Wing before being brought into the famous meeting room where Mr Kenny and Mr Trump were sitting side by side. 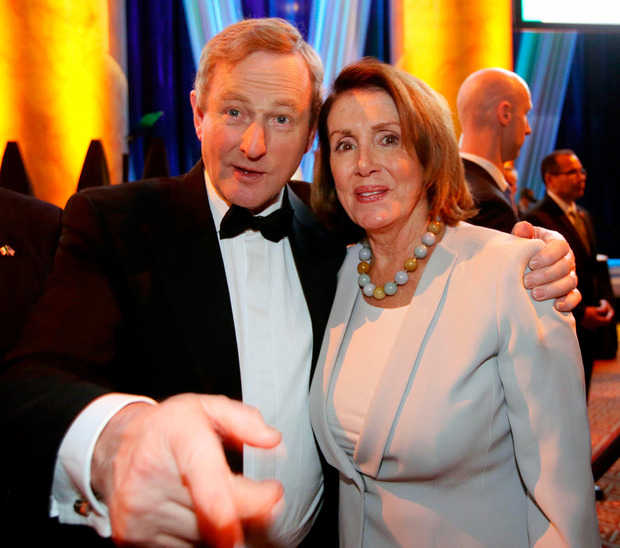 Enda and Donald looked on, caked in make-up, nodding and smiling benignly, as if this was an entirely normal state of affairs. Given the meeting hadn't yet taken place, potential question topics were limited, but Mr Trump confirmed that he would be visiting Ireland. "I love Ireland, I'll be there for sure," he said. It wasn't clear he had even been invited. Mr Kenny later confirmed that he had invited Mr Trump to visit Ireland during his presidency, because in Ireland "invitations are always returned, and returned in kind". We can't see that reasoning doing much to stop the likely protests. But if this Washington trip is to be Mr Kenny's last major gig as Taoiseach - and maybe the only person who hasn't 100pc accepted that is the man himself - his lacklustre press conference suggested this section of his political career was ending in failure. Events early doors at the subsequent lunch at Capitol Hill only added to that feeling. 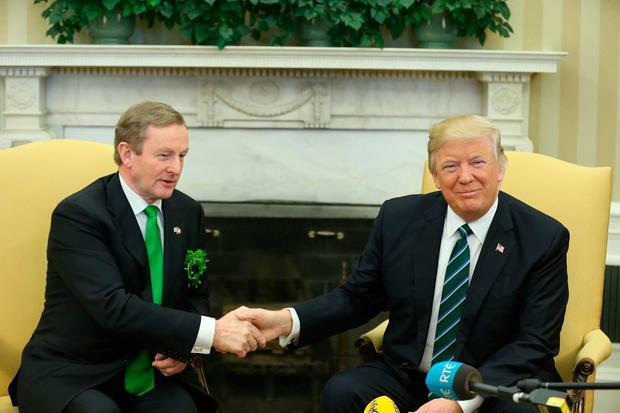 "Tee-shock, that's my new friend, my new friend," Mr Trump said, largely going through the motions, although he did have a moment for the Taoiseach's wife. "And you, Fionnuala, you are something very special. In fact, we talked, we're friends now too, right?" he asked. "Absolutely," she replied. On the issue of Trump's crackdown on immigration, Mr Kenny advised undocumented Irish workers in the US to clear up any "minor indiscretions" they may have committed, like unpaid parking tickets or traffic fines. This seemed to be yet another indication that Mr Trump's wants had dominated their earlier meeting, but if they had, Mr Kenny wasn't prepared to leave it at that. "I'm always struck by the American national anthem … For us … you say the land of the free and the home of the brave. Our people are as brave as ever but maybe not as free," he said. "This administration, working with Democrats and Republicans, I hope can sort this out for once and for all." "There are millions out there who want to play their part for America and want to make America great again." It wasn't much. We weren't expecting much. But it was something. Now to revoke that invite.